How to Rip DVD to AVI or Other Video Formats on Windows PC? Want to rip DVD to AVI, WMV, FLV, MP4, or any other video formats? Free download No.1 DVD ripper to have a try! Many of you may find it's not always possible to watch movies by ripping DVD to AVI, MP4 or so on your PC. What is the problem? It is mainly because the DVD may be encrypted with CSS or other copy protections. But it is of course not a good idea to watch movies by using the DVD player of your computer. So what you need to do is to rip DVD to AVI/MP4 or other videos so that you can enjoy the DVD movies randomly and make a backup of the DVD collections. What is DVD rip? Generally speaking, ripping DVD means copying the DVD content onto your PC's hard drive, which is good for DVD content backup without any damage/loss of original disc, DVD playback on PC or players while removing the copy protection. Moreover, you can share your favorite DVD with your friend by transfering the ripped video to media device, and much more. Although it has been a common activity performed by many software programs, still many advanced computer users don't know how to rip a DVD. This article helps you know how to rip DVD to AVI. To rip DVD to AVI, WinX DVD Ripper Platinum is one of the best DVD ripping programs, which enables you to rip DVD to AVI or other video formats, such as MP4, AVI, WMV, MOV, and so on. Supporting almost all protected DVDs and latest DVDs, it can rip various DVD and enable DVD to be playable on iPhone, iPad, iPod, Apple TV, mobile phone, Android, PSP, etc. It is also well prepared for extracting DVD audio into MP3 music file. It supports easy to add or remove subtitles for output video files, to capture screenshot from DVD video. WinX DVD Ripper Platinum owns powerful functions, and allows users to control all video/audio parameters simply at will like the output image size, video/audio quality. Support ripping with single or batch mode. 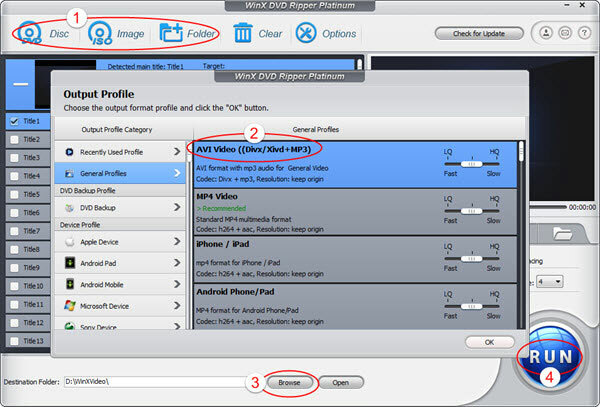 These are three steps in all to rip DVD to AVI by using WinX DVD Ripper Platinum (Mac version here). Even a newbie can finish the ripping process without any trouble. Insert your DVD first, and then click "DVD Disc", "DVD Folder" or "ISO Image" button to load DVD content. Select the output video format, here we choose "AVI video (Divx/Xvid + MP3)" format at General Profiles, and then click "OK". Confirm the output folder by clicking "Browse" button. You can also edit/adjust the video/audio, add/choose subtitles. Press the RUN botton to start the DVD to AVI ripping. It will not take a long time to finish the DVD to AVI ripping process. You will get your DVD movies with AVI format and play it on your computer or other media devices as you like. 1. You can store any image appears on the movie by clicking "snapshot" button. 2. You don't need to stay before computer all the time, you can click "Option" button to choose to shut down computer automatically after conversion completed. 3. You can customize stylish video by change the parameter settings, and drag the scroll bar to clip any video segment you favor. WinX DVD Ripper Platinum for Mac: Mac version WinX DVD Ripper Platinum, runs perfectly on Mac OS X Tiger/Leopard/Snow Leopard, convert DVD to MP4, MOV that are playable on Mac computer, as well as iPhone, iPod, iPad, Apple TV, etc. DVD to MP4: Convert DVD to MP4 MPEG4 (iPhone4 iPod iPad Apple-TV). DVD to iPhone: Rip and Convert DVD movies to iPhone.